Arrival to Bangkok is scheduled to 6:59 AM. Once in the airport, we must pass immigration control, taking our baggage, getting a local SIM phone card and picking the car. With it, we will drive one hour directly to Damnoen Sadouak. Our wish is being in the floating market before 9 AM, the time when the trips from the city arrive and the market gets crowded. After one hour on a boat through the khlongs, we will come back to the car with some fruit and snacks to eat in the two hours’ drive to Erawan National Park. 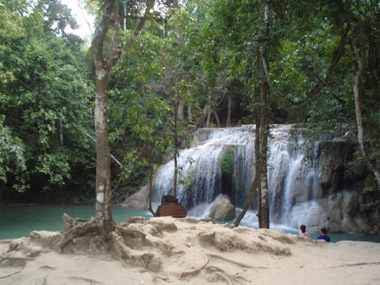 We will explore the seven levels of falls in there and swim in some of them. We could lunch there too. Once ready, we would drive back the same road for one hour to Kanchanaburi, where we’ll spend the night. The hotel is close to the war prisoner’s cemetery, the Bridge on the River Kwai and the night market. We must buy some mosquito repellent here. This is also the day of the Bridge festival and we will enjoy the sound light show and fireworks at dark. We land in Bangkok at 6:55 AM. I can use a smoking room just before immigration, where there are long queues on despite of the several boxes for passport control. The trick would be joining on a queue to a box attended by two officers. I learn this while waiting in my queue to a single officer box and seeing how nay row is faster than mine. This way, we get access to our baggage after one hour and a half. We need to exchange money now and we know the change is always bad on airports offices. I change 500€ anyway as it is what I’ve calculated we’re going to need until reaching Bangkok after one week. I get 19080 Baht from which, I’m going to give 12250 to the man waiting with our car, and spend one week with the rest: 6800. Although on this week, we4 already bring 400$ to spend the three days we’re going to be in Cambodia. We walk to gate 3, where the email from the car rental company says someone will be waiting for us but before reaching it, I’m paying attention to the stores until finding the True one where I’m going to get a local SIM card for my free phone. I’m told they’ve got a plan for internet, but it is not valid for Blackberry. I get 500 Baht for voice and the confirmation I’m not going to be able of using my phone as GPS. I can see some losing in the future while driving, but let start by getting a car and, in this way, on Gate 3 we can find a man with my name. I explain to him the delay is due to immigration, but he is used to it and just answers it is normal. He is wearing a turban and is also the manager of the company. Once in the car, it is already 9 AM and I wanted to reach the floating market before that time. I’m resigned and drive following my maps: taking Highway 7 and then 9. It is well signed and, just by knowing the number, it is easy to follow the route. We’ve paid two tolls in these highways: 20 Baht for the first and 35 for the last one. In the road we’re amazed with anything we see around, although it is so less what can be seen from the highways. Our first picture goes to a statue of a three-headed elephant. Here the roads have a way for turn around to the opposite direction very often which helps a lot to rectify when taking a way wrong. This could be problematic because the pass to the other side of the road must be in the lane at right, which here, where they drive by the left side, it is the faster lane. This makes you can find slow and stopped cars in the left – as expected – and at right too, waiting for the chance of joining to the other direction. But I use to it with no problem. On the faster highways, they avoid this by making a whole 180º bridge for turning around from the left lane, as all the exits. So we get road 35 with just a few mistakes easily solved paying attention to the branch which can address us to the floating market. In our way we could see a lot of pictures of the King which, every few kilometers, show him young, old, seated, standing, or doing whatever existing activity. These are yellow platforms over the road with a big picture in the middle. Once at motorway 325 we’ve definitively discarded the stop in Maeklong market and we’re finding narrower roads with sellers in every stop. I cannot identify the items they’re selling: a sort of string of yellow flowers. It must be something very local as they’re not coming to us. The curious is, these people working at road are all with the mouth covered, but they’re not as surgeons, like we could see some people in Japan, China or Michael Jackson, no; these are using a handkerchief or something covering all the face below the eyes. So we must use to drive between people dressed as bandits. We finally find the turn to floating market, where we arrive at 11 AM. I had the idea touts were trying to get you to their place in the way lying about the way to floating market for sealing you a tour, but it is so late that they’re not already there. We park in a quite empty big gravel area and a woman with one of those guys dressing as bandits come to us asking 20 Baht as parking fee. I don’t know if it is a scam or not, but I’m not going to argue by 0.40€. I’ve got a receipt in return which could say I’m a dummy tourist paying for nothing, but as everything is written in thai characters, I’ll never know. Sellers from the closest shops come to us showing different items. My wife likes a white silk dress (top and trousers) and when asking price we’re showed a big calculator where they type 3000 Baht. I tell my wife it is like 60€ and she thinks it is ok. “It is not expensive. It is silk”. “What I told you about bargaining! ?”, I answer and I take the calculator thinking what amount to type. We’ve just arrived and I don’t feel ready so, when I see the faces of the women after seeing my offer of 400 Baht I don’t know what to do. They ask me if that is for both pieces or just the top and when they see I don’t know what to do and we are in a rush now, we get the deal of discussing about it after we visit the market. Our car is there and we’re not going anywhere else without it. Then we walk through a bridge over the canal and have our first sight of the floating market. I’m thinking about looking around for a while and missing the hour in boat as we’re so out of time. My wife goes to take a coffee and I get some pictures from the road, surprised for seeing there are no tourists as I thought: they must be gone elsewhere at this time. When we’re going to get the stairs for going down an old woman offers us 300 Baht by 30 minutes ride on boat. My budget was higher for this activity and 30 minutes is ideal for us now, so I say yes immediately. Later on I think I could do some bargain, but we’re tired and it’s time to get some fun, so I forget about it. Boat is stable and the boy managing it, which is seated behind us, drive us around, through an area full of boats selling different goodies but we cannot see foreigners. Then we go further, where it is completely quiet and the shores show some green. Definitively we’re the only tourists. We’re enjoying a lot this ride. The stores on the edge and the boats in the canal use a hook to get our boat beside them. We’re saying no to everything except to a cocoa from an old woman, who opens it and put a straw in it. It is a refreshing drink. We’re avoiding buying anything here because I know we’re going to find the same items later at better price. As this is a touristic attraction, prices are inflated but people are so friendly and make us feel bad when leaving with no purchases. A half of an hour has been enough. Once in the parking area we want to go on with the bargaining for that dress, but the shop is closed now and the women are no longer there. We even ask about them to the people at the rest of shops but they don’t know and don’t have the same dress, so we leave without it. We drive directly to Kanchanaburi in a ride we feel as long. My wife can barely keep her eyes opened and, fortunately, I still can drive. We stop at hotel after one hour and a half. We pass the hotel at first but could turn around and find it driving more carefully by the area. Once at room, my wife, tired, says “give me a minute” and falls over the bed. I hear: “Bum”, and then “Damn it!”, and I remember to read about how hard mattresses in Thailand are. We rest a little bit, change clothes and use bathroom before leaving the hotel to come back to the road to Erawan. Our highlight for today is in danger: it’s 2:30 AM now and Erawan closes at 5 PM, it’s a trip of more than one hour, we’re sleepy and we still haven’t eaten anything since our last meal at plane. I keep following a car driving above 100 Km/h taking over everything we’re finding on the road, so I reach the National Park entrance some minutes before 4 PM. I’m remembered there they close at 5 PM and we’re going to be able of seeing two of the seven falls and I agree and pay 430 Baht: 200 admission fee per person and 30 for the car. Walking up the path to the falls we’re crossing with the people that are leaving, they’re all wet. It’s a 750 meters path to the first fall, but we’re still stopping here and there enjoying the tropical vegetation with lianas and bamboo. But nothing can be compared with our amazement when reaching the falls. Although I had seen a bunch of pictures of the place before, the live landscape exceeds anything else. The river is making its way through a sort of staircase with steps made by pools of turquoise waters. 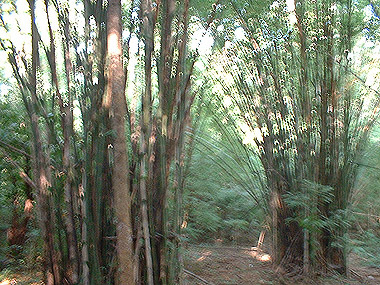 Rainforest is on shores with trees with intricate roots over the ground. Every corner deserves to be a Windows desktop background. We’re completely alone on this first falls and I only can give up to my wish of joining the landscape, this is, taking a bath. I expected the water temperature to be hotter, but it is perfect. It is not deep enough here for swimming. We then walk up going on with the path and, when we can read a warning about monkey presence, we can see the next falls. The noise was announcing them just a bit before. It is higher and more spectacular and I immediately get into the pool and swim until being under the water fall. There are fishes here as the ones used for pedicure, eating the dead skin off your feet, but as they’re on their wild, there are fishes of all sizes. You can notice them at the very moment you stop moving and, although the biggest ones can be impressive when approaching to you – which makes my wife cannot get too much inside the water – I just feel some tickling. The water is clean and you can see them all the time. After a while, which we feel so short, we can hear a whistle as a sign they’re going to close. We wanted to plan going to the third falls, but we’ve enjoyed a lot on this one. Walking down to the parking area we agree on this is a fantastic place which deserves to spend a whole day in it. We just hope live gives the chance of coming back here. The swimming has helped to awaking us but while driving back to the hotel for more than one hour, I’m noticing problems for keeping the eyes opened. It is dark when we reach Kanchanaburi and pass by the festival area, where we can see a lot of live and lights from the funfair are with us on the last minute of today’s car route. We’re talking now about walking to the Bridge on River Kwai for watching the light & sound show and fireworks, we’ve got enough car for today. In our way we see some places offering food, but we don’t like them, so we come back to the hotel and take our dinner – which is also our lunch – there. While waiting for our food, my wife asks me if it wouldn’t be better going to sleep but I’m thinking about how using sangtaews we’ve seen in the street to reach the festival. We’ve even paid more for being here in the festival day as per missing it just because we’re tired. Our meal arrives: a couple of soups and a prawn’s omelet and a salad for sharing as they’re so big. Somehow, I find myself waking up because Eva has just shaken me because I felt sleep over my piece of omelet. That’s the final sign: To hell with the festival, let’s go to sleep!. We’re at bed at 8 PM. Well, it’s just me, as my wife makes a kind of sleeping bag with the bedding to sleep on the floor stating it is softer than the bed. We both are finally sleeping in no time.